Beefsteak Begonia (Begonia erythrophylla) is both a plant for the home and garden. There are many Begonia varieties out there at garden centers and nurseries but finding the Beefsteak Begonia may be a challenge. It is not a commonly found plant and has a history (or story) of being passed down from plant lover to plant lover throughout the years. And this is how I came to care for my two Beefsteak Begonias. An old friend gave them to me 5 or 6 years ago when she could not care for them any more. She told me she was given the plants by a friend a few years before. 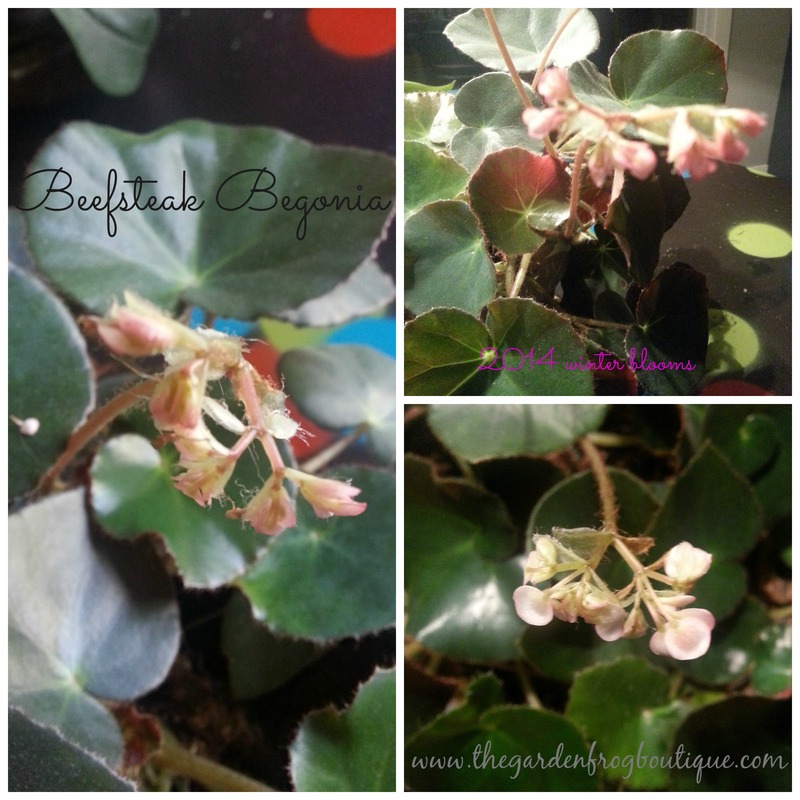 My Beefsteak Begonias are still in the same pots and have bloomed for the past 3 years in the winter. They are not real impressive blooms but they are blooms. 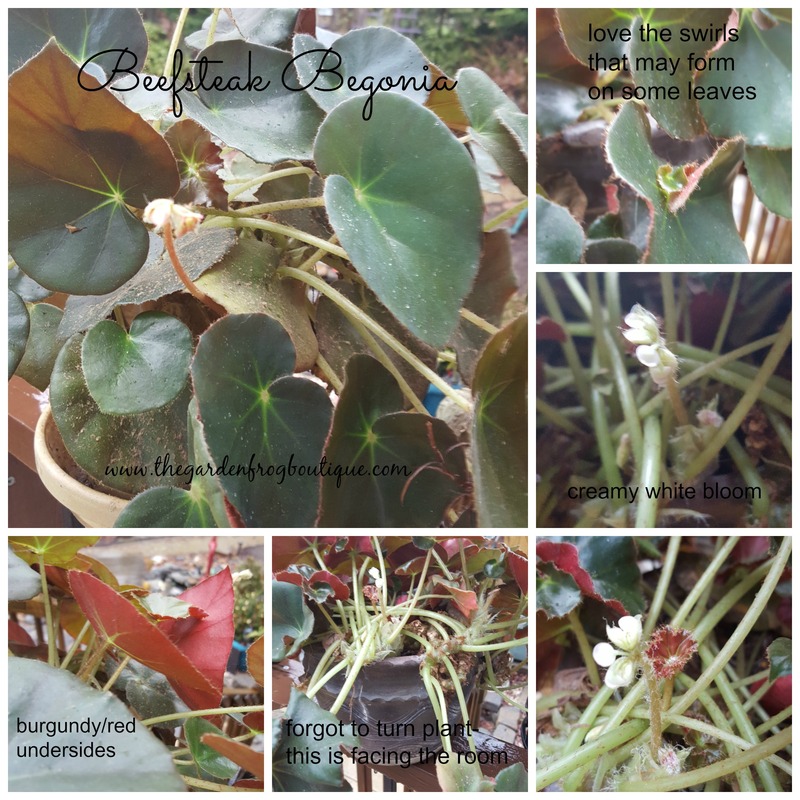 What is more fascinating is that each Beefsteak Begonia has its own color of blooms- one is a creamy white and the other is a very pale pink.You will also see that one of my begonias has swirlier looking leaves than the other one. The Beefsteak Begonia does not like to dry out but does not like to have wet feet either so you need to make sure you have a well draining pot. The Begonia loves the heat and humidity of summer in the bright shade of the gazebo and the leaves really show off their color. In the fall I let my houseplants stay out until the night time temps start to fall around 45 degrees. 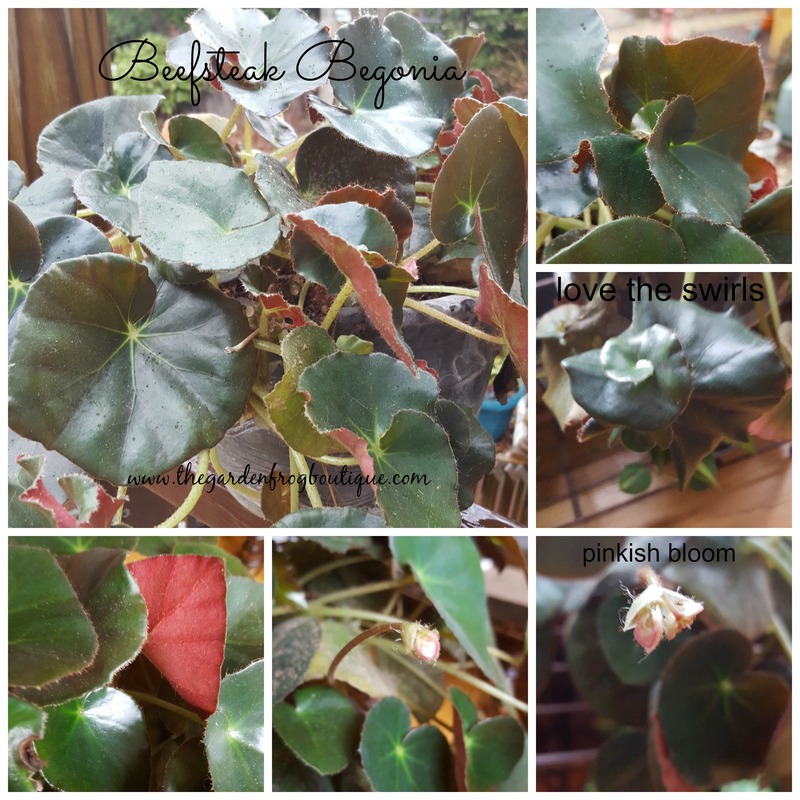 Many plants need this chill to trigger them to bloom and since I started doing this with the Beefsteak Begonia, it has bloomed in Jan-March. I need to repot my Beefsteak Begonias but they are growing so well I hate to disturb them. 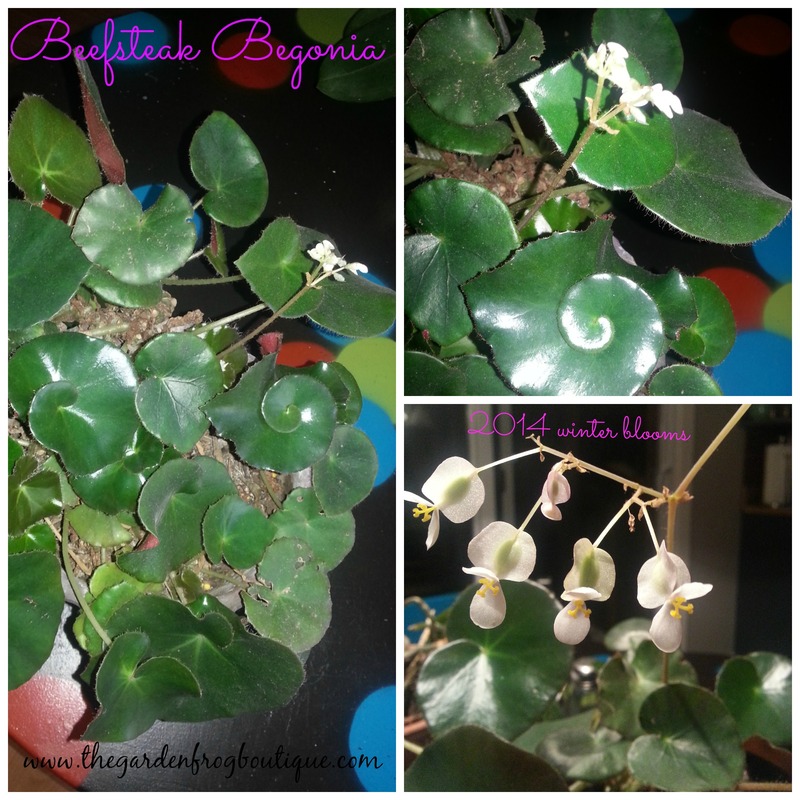 Do you have a Beefsteak Begonia or other Begonia you have had for years? I would love to hear from you if you do! I would like to know how to divide my plant? My beefsteak begonia has curled leaves and it still has not flowered for me but I know it has before since I gave it to a friend because it almost died and she revived it for me and it has been beautiful ever since….I also love Immense begonias and angle wing begonias both are easy to grow and flower too….thanks for you web page !!!! I am wondering if you can “train” a beefsteak begonia. My begonia is growing healthily, but I am concerned about the direction of the rhizome stem. It grows horizontally and is now hanging out of the pot. I’m worried about the weight of the leaves and if it will just grow downward. Should I try propping up the stem to encourage it to grow in a different direction? Or should I put it in a bigger pot and let it lay on the soil? (I’m hesitant to repot because she seems so happy.) I would appreciate any advice. Thanks! I have not reported mine in 6 years. I just let him hang out of the pot. Mine are blooming again and they just seem happy and if they are I would not do a thing to it I would just let the leaves flop over. I just let mine be. You could try to root them by putting a small pot with dirt next to the main pot and setting the leaves or if the rhizomes the thick stems are growing out of the pot try to root it that way. Did that make sense? Just let the tap water sit out for a couple days so the chemicals can dissipate. If you want them to bloom as mine do every January-April then put them outside in shade and let them enjoy the outdoors. I bring them in when the nights start to go around 45 degrees In October in my zone 7. I have not repotted mine in 8 years either and find they do well. I love mine too. Fertilizing is something I rarely do but a weak strength fertilizer should do fine. hope this helps. I have hunted for it myself. I am going to build a greenhouse this fall and hope to propagate it. I have seeds too I want to see if they germinate. I’ve had my Begonia for two years, given to me by a friend, and just found out the correct name yesterday. I keep it near a bay window, and water it once a week. It is in a med. pot, and I’m afraid to put in a larger pot, fearing I will kill it. I haven’t given it any plant food, or taken it outside. I’m glad I found the hints from reading today. So I need to get some Alask. Fish Food for it? How much, and how often? Everybody admires this plant, even the friend that gave it to me said that mine looked better than hers. I’m really not a plant person, but this plant has given me a lot of interest in plants. so sorry for not getting to you. my life has been in a tizzy since I had to move in to a camper after selling my home after a divorce. no excuses I know but sometimes life just takes us somewhere else. anyhow I fertilize rarely! maybe every couple months and I still haven’t transplanted mine in to a bigger pot after 7 or 8 years! I have taken cuttings from it and they have become huge plants, mine I do let dry out, they are in west and east windows but I would like to try them outside somewhere, do you have any suggestions. Hello, I inherited my beefsteak begonia four years ago when my great grandmother passed. It has survived two moves with me and always done splendidly. Recently, however, its really not doing well. One whole stalk has shriveled up and died and its down to just a few leaves on the other stalk. I hadn’t changed any watering habits or location so I am unsure what’s going wrong. I really don’t want it to die, any help would be very much appreciated. I just bought a beefsteak begonia in a small old makeup shop that has been owned my the same lady for 30 years on my trip to St Louis Mo. I bought it in a terracotta pot for $5 and was very happy with the purchase as I’d never seen that variety of begonia before. I did my best to keep it happy and safe on the 4 hr drive back from my trip. But sadly snapped a gangly leaf off… Oh well i suppose I’ll give propagation a shot right out of the gate with this plant🤷😂. Thanks for sharing the info about the care for this plant👍.